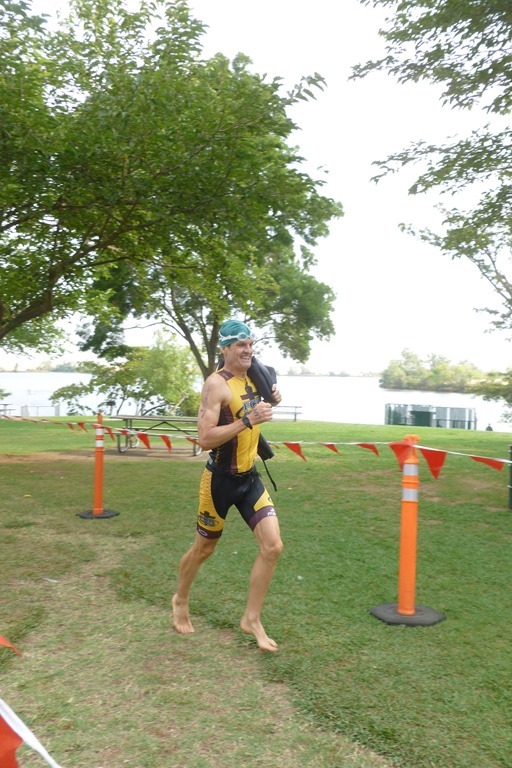 Looking forward to racing today even though I’ve had limited time to train over the last 3 weeks. 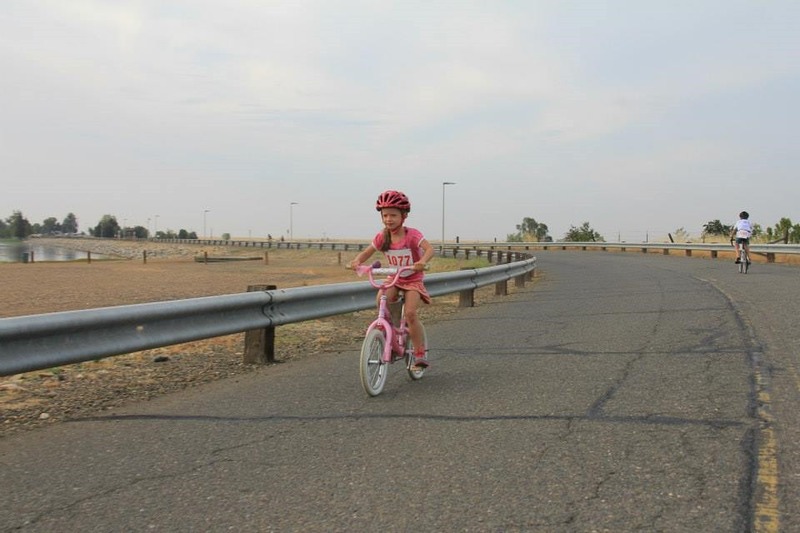 I convinced Charity to race today, too…she is in the same boat. We carpool to Winters…enjoying the farmlands and hot air balloons as we get closer. 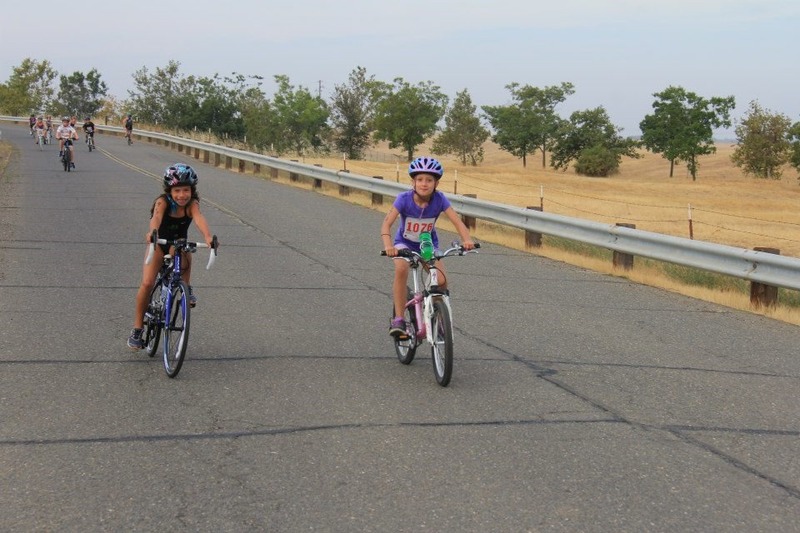 We talk about recent rides and Charity tells me how her front tire flatted while descending Mt. Vernon Road. Scary! As we head over to registration we see a teen race volunteer back up right over a guy’s bike that was lying on the ground…crunch! Oh, that is a terrible sound and the cyclist is getting mad! It’s too hard to watch so we head over to registration. I hope that guy can still race! Registration is easy as there are few Women’s 4 riders! They have changed the race finish. I check out the hand written map and cannot make any sense of it. I guess after the first loop I’ll figure it out! We then head out for a warm-up. It’s pretty warm already. My legs feel pretty good but I have doubts about my fitness. We pray before the race for safety and a good day. Then we line up on time but the races are running behind so we have to wait. I try Charity’s trick of sticking Clif Blocs to my top tube. I show Charity a video of a 4x 400 meter relay race where a team back in 4th place actually wins the race. It’s a great example of never giving up! Okay, time to roll. The head ref tells us to stay neutral until we get to the main road. As I start up I notice I’ve already lost a Clif Bloc. I grab the one remaining and gobble it up quick just in case! I haven’t ridden in a pack in a long time and I'm definitely being tentative. Charity is right in the mix and positioning herself well. Within the first 5 miles, the Men Masters 30+ 1/2/3/4 are passing us. I hear Lance cheer for Charity and I. Wow, they are booking! They must be on lap 2 of 3. If only I were starting my 2nd and last lap! Our group of girls is sticking together well. I’m anticipating a lot of girls will fall back at the big climb! At mile 10, the grade is building. I’m at the back of the pack and stuck here. I should be able to get ahead once the group splinters. It gets steeper and a big group is still pushing hard and holding their ground! I push hard to get around only a few girls struggling and stay with the large pack that is trudging up the hill strongly! I catch Charity and encourage her to keep at it. At the steepest part of the hill which is also the very end of the hill, I am amazed at the big group of girls still riding strong. I’m just barely with them as the descent begins. I’m pretty wimpy at descending but have improved. There is a gap forming but I still am close enough to close it…this is exciting! As the descent starts to straighten out and flatten out I hear a loud pop and realize my front tire has just blown out! I’m scared but keep composure and try to brake carefully. I’m heading straight for a CHP officer at the bottom of the hill. I’m about to yell for him to grab me but I’m able to stop just in time. Phew! Thank you Lord for keeping me upright! How ironic that Charity and I were just talking about her flat! Charity rides by and I tell her to go for it. I know now that my race plans have changed. As I change my tube, I think back to that video. I know that my goal today now is not to give up even when it looks bad. Chances are I won’t catch anyone in my group, but I’m going to try! After 5 min, and a little help from a stranded rider who helped me with my inflator, I’m off. It’s time-trial time. 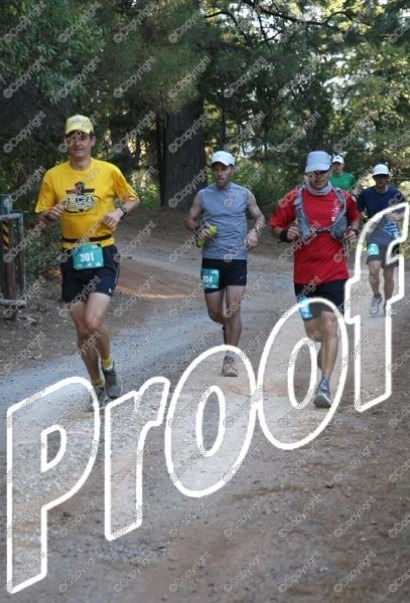 15 miles into a 48 mile race…boy this is going to be a long day! 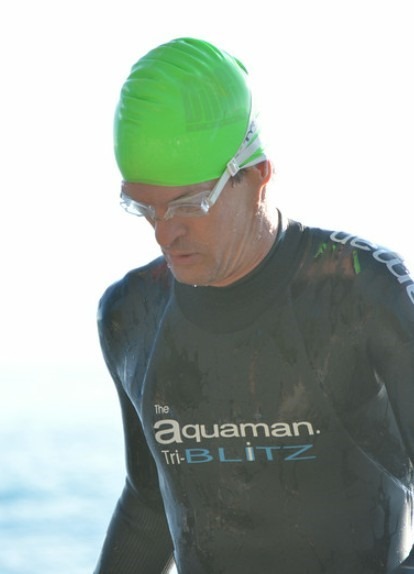 As a triathlete I cannot be too upset because it is still good practice. I’m surprised to find that 5 miles down the road, and around a corner, is the finish! Ah, it’s closer to the end of the hill…good to know! The next loop is pretty lonely but the Lord provides a few stragglers to watch. I pass one guy and we chat briefly. We both agree that this is good practice in perseverance! I make it to the hill and still no sign of any girls. A group of guys starts to pass and I cheer them on…until the group gets larger and rides dangerously close to me…at this point I’m just concentrating on staying upright. Not too long after, a paramedic and fire truck is passing with their lights on. Oh dear, not a good sign! I wonder who is hurt and pray for them. I feel good climbing. I’m alone so most likely not climbing as fast as with a group, but still trying to push hard. On the descent, I’m much more cautious and in prayer. I make it to the bottom unscathed. Thank you Jesus! The Women 1/2/3s pass me with a follow car. I pick up the pace and try to keep them in my sight. I cannot use them or the car for a draft so I carefully keep my distance. This is great motivation and helps those last miles fly by! 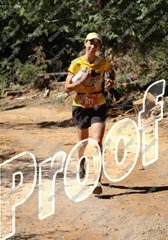 In the last few miles, the pack slows way down and I decide to pass instead of slow down to keep my distance. It seems funny that I’m flying by these pro women but I’m certain my pass will not last. Sure enough, they soon start their 1K sprint and pass me back like I'm standing still. I put my head down and dig deep on my own. Got to finish strong! I briefly look up and see a bunch of cars stopped ahead. Uh oh, there was a crash in that group of girls. I slowly weave my way through the crowd of fallen riders and cars. Bystanders are helping girls off the road and out of a ditch. Poor girls, looks bad but fortunately not serious! 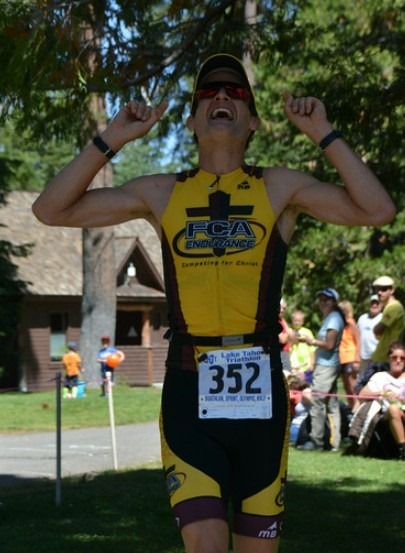 My finish is anticlimactic…but I'm done! Thank you Jesus! I make sure my result is recorded and then ride the long 3 miles back to the car. Glad to be done! Good effort today! It’s great to be back at this race…and with Troy! It’s like a date! Last year was a great race but, later that day, I got sick and it turned into pneumonia. That was right before IM Tahoe and it sure made things uncertain and hard. But, Jesus brought me through the pneumonia and the 32 degree air temp at Tahoe…so He’ll help me through today…and through the hamstring soreness and general fatigue. Troy takes off an hour ahead of me. It’s nice to cheer him along with Rich Alesci, Lee McKinley, Austin Twietmeyer and Tim Twietmeyer. I’m praying that his hamstrings will feel great and that he’ll have the fitness to push it out there. I hope he also has fun! We pray before he goes and it puts us both at ease. I run into my college roomie, Leonie, and Megan Sebra. They are racing the 12K in preparation for our CIM Relay. It’s an all girl and all Aggie team…yeah! I also run into Gary Carpenter, a Tuesday Track veteran, and his friend Manouch. It’s time to go! We line up and always fun and witty Courtney Cardenas counts us down. It’s go time! The first 1/2 mile is uphill and I love it! I feel good and get in a good position. There are 4 girls ahead of me. Mile 1 is 9:04. Feeling good but trying to hold back some. We are on a beautiful fire trail along a water canal. Mile 2 is 7:58. I pass one girl and get close to the next gal. These hills are really helping me! Mile 3 is 8:03. I make it to the top and the first aid station. Some friends are there cheering me on. It’s nice to have the support! The dirt on the trail up here is really loose. There are many ruts in the road but they are hard to see when the sun is blaring down. It’s hard to keep a rhythm on this! Mile 4 is 9:43. The girl I was catching up to is pulling away. I continue to struggle with the footing but still feel pretty good! Mile 5 is 7:41. Okay, getting into a good grove. Heading downhill! Mile 6 is 7:37. I am all alone now! It’s hard to push without some motivation! Mile 7 is 7:55. A guy passes me up and now I’ve got a carrot! We head down to the next aid station. He stops and I keep going. I start to head down the super steep and rocky part and he catches back up. I pull over and almost fall over from the momentum. He passes and I try to move as fast as I can. For a mainly street runner, this is a definite weakness! On another spot I almost trip but recover…thank you Jesus!! Mile 8 is 9:26. I finally make it to the lower campgrounds and take a road to the left. Last year I went right and around the lake. Now I’m in new territory! I’m climbing again and catch up to that guy. Another guy flies by and I try to match his speed but he is strong! Mile 9 is 10:37. My hill climbing is not as strong and I know it’s because of my recent lack of miles and hills. I stay positive and focused on the Lord…and I’m having fun despite suffering! Mile 10 is 9:44. I see a volunteer walking down the trail so I know the aid station (the first one I passed) is ahead. I don’t need anything but it will be nice to have some cheers again and from my friends. Mile 11 is 8:48. I’m so looking forward to the turn off back down to the finish! Where is it? I’m really tired but just trying to hold on! I’m alone again but I know there are folks coming from behind. I’m back on the loose dirt…ugh, hard to stay steady! Mile 12 is 8:56. Finally, the turn off! I head down a steep single track. Just like last year, my IT band attaching to my left knee starts to twinge. Ouch! I have to slow down and run with good form. Funny how it’s the same exact place on the course! Mile 13 is 8:36. I’m back on the fire trail. I hear footsteps behind me and make a quick look back (something I rarely do!). I can see a runner getting closer and cannot tell if it is a girl or guy. That’s just the motivation I need! I pick it up and push hard. The IT/knee is still giving me reminders so I have to continue to take the time to focus on form. Finally the finish is near! I hear Courtney calling out my name. 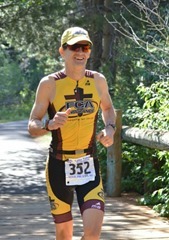 I smile as my watch hits 7:35 for the last mile. Thank you Jesus! Great to be done! I rest for a few minutes and here comes Troy! An hour a part we start and 3 minutes apart we finish…Awesome!! Although my first time on this course, the description of it is clear to me thanks to Robin's story of running it last year. Including the vision of the wildfire smoke that covered these hills last year. Fortunately there are no fires in the northern Sierra's this time. Our friend, Courtney Cardenas, is announcing the race and saying some pretty funny comments like usual. Robin and I pray before hand. Both of us are concerned for our hamstrings and lack of long-distance run training. 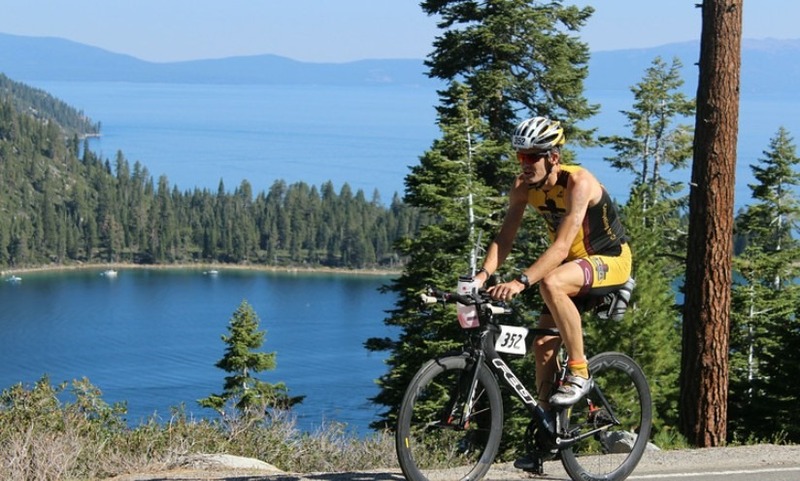 This is a perfect tune-up for Ironman Tahoe. It's a hilly 20 miles which is almost equivalent to a marathon. And it's 5 weeks out. Robin had the same plan last year and it worked, except for the part of getting pneumonia from breathing the smoke while racing hard. The Lord is already helping me out by providing inspiring running friends! Lee McKinley, Rich Alesci, Tim and Austin Twietmeyer are all doing it as well. Lee is doing the 50k option which includes a hard extra 10 miles at the far side of the course. Gary Carpenter, from track, is also here. Him and Robin are doing the 1/2 Marathon starting an hour after us. I line up next to Lee about 6 rows back. A little intimidated by all the hand-held water bottles and camel-backs. Our friend Rich is on the front line. Go! I start off with an easy pace. But seems too easy so I move up a little. I suddenly have a great idea! Instead of waiting for my hamstrings to start hurting before praying, I pray now, asking the Lord to help them so they won't get painful. I have faith He will take care of me. The 1st 1/2 mile is straight up. Robin is part way up taking pictures. Soon I'm breathing hard, pushing the pace, while many are conserving. Maybe I'm making a mistake? I'll push the hills today because it doesn't hurt my hamstrings and it'll build endurance. Plus I want to make up for going a little slower down hills, which can hurt my hamstrings. Fortunately the next few miles levels out. Shady fire-roads next to a canal. Mile 1: 9:09. Lee catches up to me. Each climb he does a fast walk, conserving energy but almost going as fast as me running & grunting. Others are walking, too. Lee says, "Tricks of the trade". I plan to stick with running… the whole course. Mile 2: 8:07. On each flat Lee catches up easily and strikes up conversations. He's truly at ease running long distance. Mile 3: 8:31. We climb up to the 1st aid station. I drink 2 cups. Lee stops to fill up his bottles. 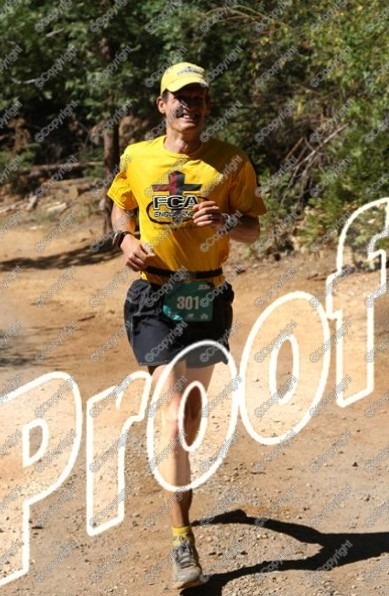 Mile 4: 10:06. Lee soon catches me again and then goes ahead to talk to another 50k runner. I'm breathing pretty hard but feeling strong. Mile 5: 8:00. I make a pitstop and then surprisingly catch up to the 2 talkative 50k'ers. Mile 6: 7:55. My hamstrings, although slightly tight, aren't bothering me, even pushing the pace downhill. Mile 7: 7:14. At the next aid station I take 2 cups again while Lee and the other guy stop to fill up and then it's a steep, rocky descent to the lake. Wow, it's very technical and I'm glad I haven't fallen. I remember now reading others' race stories about the likelihood of falling on this course and telling Robin to be careful last year. I better be careful myself. 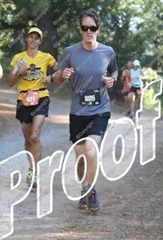 Mile 8: 8:32. It's a beautiful single-track trail up and down along the lake. Robin was right, telling me to take as many opportunities as possible to take in the view. Combined with the soft, pine-needle laden trail, and the cool shaded coverage, it's possibly the perfect running trail. The temperature is perfect and I find myself noticing it often. A warm day while running through the damp coolness of the lake-side forest - awesome. Mile 9: 8:34. I still have to keep my attention on the trail because it makes sudden roller-coaster swooping turns and dips. Some campers are starting breakfast fires or are along the shore fishing. My heart rate has been moderate, about 145, despite the sections of really hard breathing. Up ahead are 2 runners descending fast and walk/jogging the ups. I keep them in sight. Mile 10: 7:39. I'm at 1-1/2 hrs. I'm hoping to break 3hrs. Lee catches up to me again (after another break). Still as relaxed as ever. He tells me I look good and should do the 50k instead. No way, I'm pushing it and will have nothing left after 20. Mile 11: 8:51. We start having a good conversation when the trail suddenly splits and he heads farther on while I descend down below the dam, cross a stream and climb back up. Mile 12: 9:11. I pass 1 of the runners ahead. Then I see 2 more. 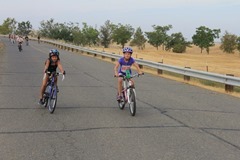 I pass them on a real steep section. I'm finding my strong point is really steep sections. I'm gasping to get up them but then recovering well. For a while we run on a flat road which is a really nice break from constant up and down. 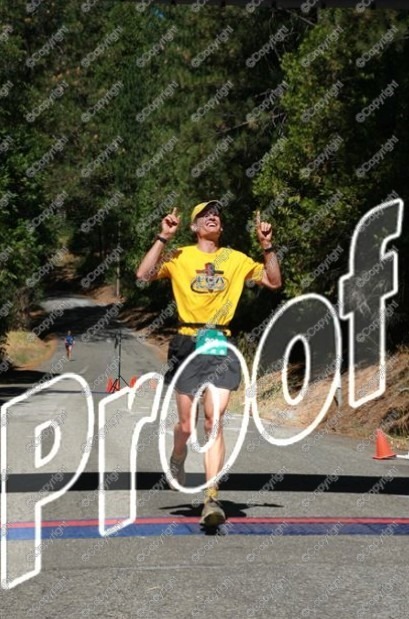 Mile 13: 9:43. I know there is a long climb over the ridge once we finish circling the lake. I'll have 2 Hammer gels in me by then and am focusing on giving it my all. Mile 14: 9:20. Every time I think we're around the lake and on the big climb out, it just turns out to be another steep undulation in the trail. There is still a runner ahead in orange that pulls way ahead on the descents. It's still shady which is nice. My foot is starting to hurt a little because my shoe is too loose. Mile 15: 8:45. I stop to tighten my shoe, but realize my hamstrings are so tight I can't bend down. I stop again when I find a stump to put my foot on. Ok, good, now to catch the guy in Orange. He's running with the leading woman now. He pulls ahead on a long descent. I pass the woman on some switch-backs. We encourage each other. Mile 16: 10:25. And now the long climb begins! The guy in orange stops to fill his bottle, as does the woman, but I grab 2 cups and keep going. I've got a gap! Many of the 1/2 marathoners are coming down towards me and very encouraging. They tell me I'm the 5th runner which is exciting. I believe my gap is increasing and I know I need a large one because on the other side of this hill, the guy in orange is going to be flying at a speed I can't match. Mile 17: 8:57. It's a long grind but I'm getting there. I'm focussing on the Lord and how much He has helped me. I'm running better than expected. Coming down this section I was dreading the return but now it's going well. I know I'm nearing the top because I'm back in the 6" deep chalk-dirt. It makes for a lot of dust. I can only imagine how hard it was to breathe with the dust plus wildfire smoke last year. Mile 18: 10:17. There's no one around now. I hope I'm going the right way. And then I see 2 volunteers and a sign pointing down. This is the steep descent Robin struggled down last year. She was in the lead at the time but her IT band was hurting which made the downhill miserable and allowed the next woman to pull ahead. My legs are all-around sore. The jarring drop is anything but relief. I stay focused so not to fall. And finally at the bottom. 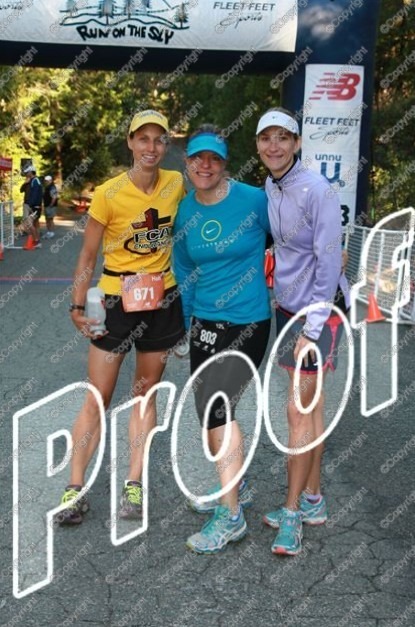 Mile 19: 8:56. I've never walked yet. And I haven't looked back. The climb was a success, but I have a feeling the guy in orange is flying down that hill behind me. I've got to push this 1/2 mile and then the steep 1/2 mile gravel road to the finish. I hope I don't have to go head-to-head with him there. I tell myself, "Just a couple fast laps around the track". 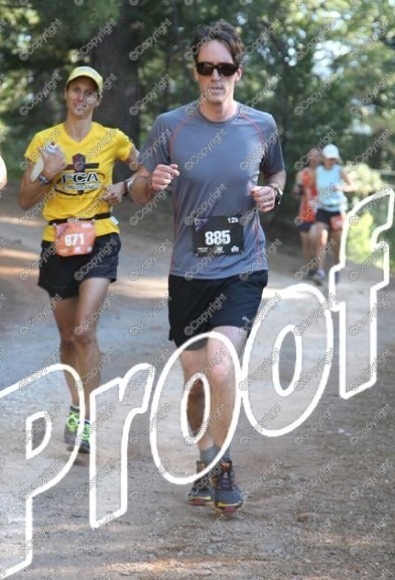 "Ok, just 1 more lap…"
Mile 20: 8:02. After 20mi, I don't see the road yet! I was really counting on being done at 20. "Ok, just 1 more lap…" Finally, there it is! The sign says, "It REALLY is all downhill from here". Whoo hoo! All I have to do is keep from falling. I descend quickly despite dreading it. I hear Courtney announcing, "Robin Soares just finished, and here comes her husband, Troy, almost finishing together after starting an hour apart". I finish in 3:03:56. 20.7mi. And surprisingly 1st in my age group. 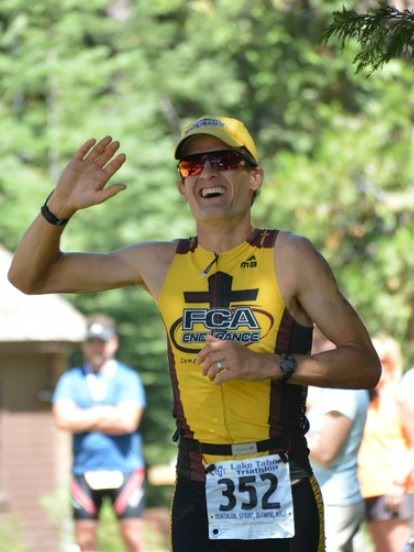 The race was a real encouragement for Ironman Tahoe because my endurance held up well even with pushing the hills. The final hills of the marathon will feel just like these mountainous ones today. With God's help, I'll get through those, too. Today is exciting for many reasons. 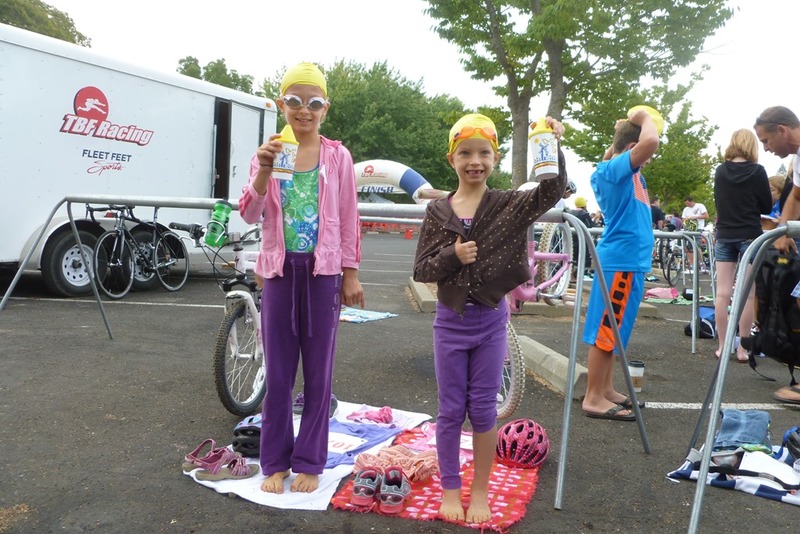 First, both our girls are doing the kids' triathlon! They've practiced, they're excited, and Anna is giving tips to Ariel since it's her first. Also, Jan & Jerry (Robin's parents) and Hilde (Robin's Aunt) are here to cheer us all on. And, finally, because I'm eager to see if I'm completely back to pre-crash fitness. I did a good 2:09 (23:17 - 1:25 - 1:01:49 - 1:03 - 41:26) last year and hope to do that again! 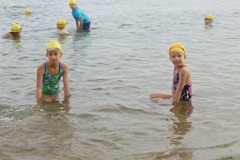 First, we watch the girls take their positions in the swim start. It's a chilly morning so they're all staying submerged in the warm water. 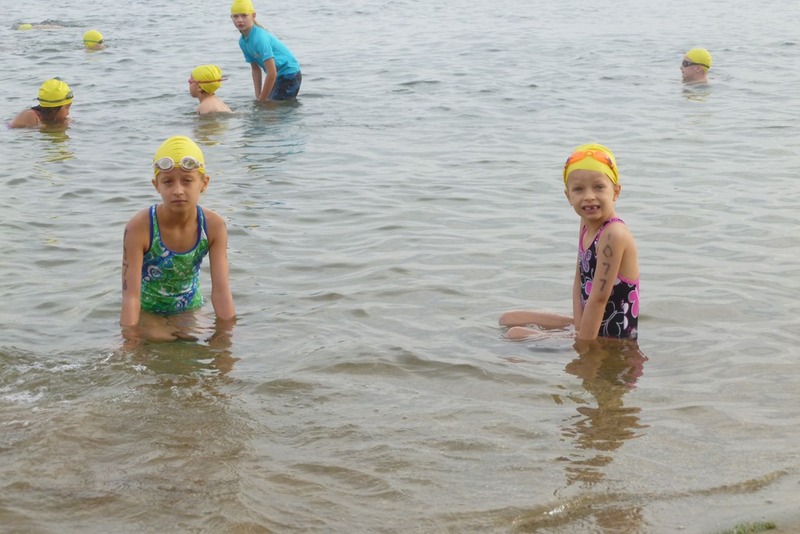 They both have smiles and seem very comfortable and confident to get through the swim. 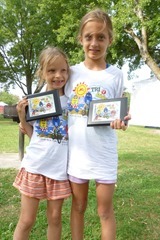 They both did swim team this summer and improved. It's nice seeing the comfort in the water that gives them. But, unlike swim meets, this is a mass start which is new to Ariel. Go! Sure enough, there's a lot of contact and bumping. I see another kid accidently push Ariel under. But she pops up with no concern and just motors along. She rolls to her back to get a breath away from the thrashing arms. And when she does, I can see she is still smiling. I see them both off onto the bike and now it's my turn to race. I pray with Robin on the beach. 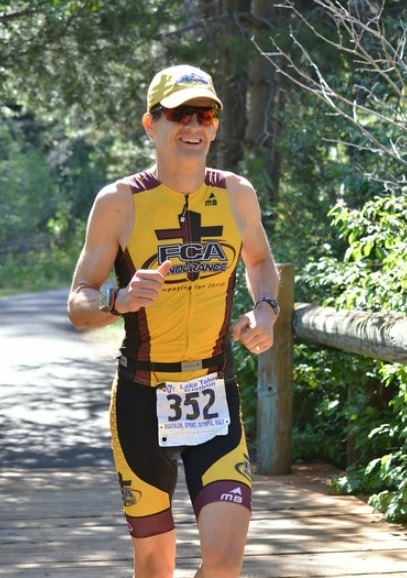 It's great to be racing with my training partner and FCA Endurance Teammate, Troy Outman. We pray together, too. He's always got a great encouraging word to focus on Christ before the race. Our wave of 40-49 is small. Behind us is the 50-59 wave with our friend Dave Campbell. He's got a really fast 10k which I'll be trying to beat today. After a warm-up, and finding some money on the bottom of the lake, we take our position. Go! I push hard right from the start. Not many take off ahead. It makes me feel fast.. or there just aren't many racers. I have to start letting water into my suit early because the water's so warm. After the first turn buoy I find someone to draft off of but they're zig-zagging. Still it's a benefit. But at 1/2 way I take the straight line alone and find it's actually a little faster than his zig-zag. After the 2nd turn buoy, it's a straight-shot back to the beach. I feel like I'm swimming well, especially for not training much in the pool, but then I start slowing down. The beach isn't coming as fast as I expected. It's takes a long time. Finally I touch bottom and hustle, high-stepping out through the arch. 24:48, 1-1/2 mins slower than last year. Suit comes off fast and soon I'm at my transition. 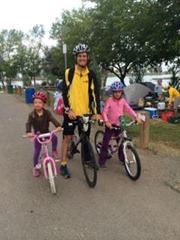 I get a good transition and hop on my bike quickly to the great cheers of my family and other supporters and friends. Yesterday I rode 8mi and was feeling the "groove". If I can get it again today, I feel like I can get my goal of 1 hour. Plus I have a new bike and race wheels. I head out to the rode and start looking for the groove. I feel fast. The road is very smooth. It's a great course. I pass a couple guys ahead. 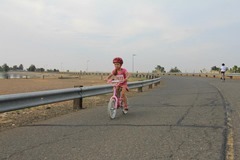 The wind is usually at our back and then a head wind coming back so I have to push it now to make good use of it. I'm not finding the groove as well as yesterday (later, I think I wasn't relaxing enough but was ahead of my pedal stroke). Nearing the turn-around I count the riders going back. I'm about 10th (including the wave ahead of me). I make the turn and expect the head wind.. but there isn't one! There's really not much wind, that's encouraging. A guy passes me and it's just the motivation I need. I try harder. He let's up on the rolling ups and that is where I pass him. But he passes me back on the flats. 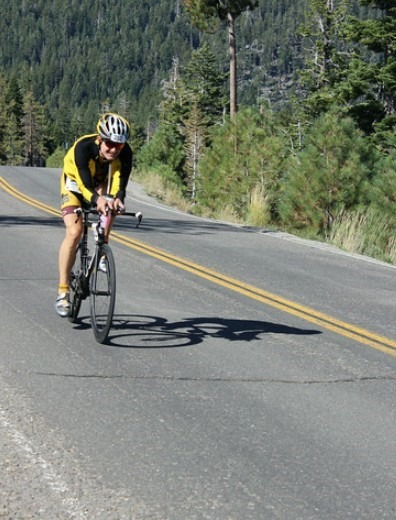 I stay aero as much into each hill as possible and am able to continue passing him. But the last 4 miles on the main road I can't catch him. But I know to not give up.. anything can happen. 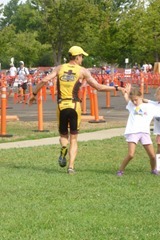 Once into the park, he lets up some and I re-pass and hold it to the transition area. 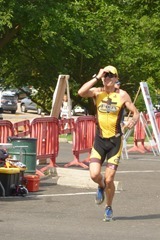 I pull my feet out and stretch a bit before my dismount.. and he passes me one last time and beats me into transition. 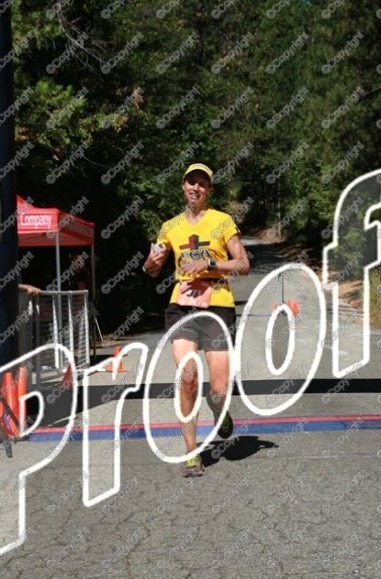 1:02:47 (1 min slower than last year). My dismount is fast, and I lose a shoe (a volunteer grabs it for me) and hurry to get in running shoes. I stop to tighten my shoes and then I'm off. Robin and family are cheering for me. 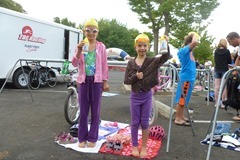 Anna & Ariel are cheering loudly and telling me that they did good in their race. Troy's wife, Sara, also cheers me on. This all helps so much before heading off on a tough 6.2 mile run. I shove my Hammer Gels in my pocket and take off to hit the fire roads. I'm running well and thankful that my hamstrings aren't an issue! I'm actually striding out. But at mile 1, I feel them come back. The tightness is threatening. I have to think of form a lot to help reduce the strain on them. 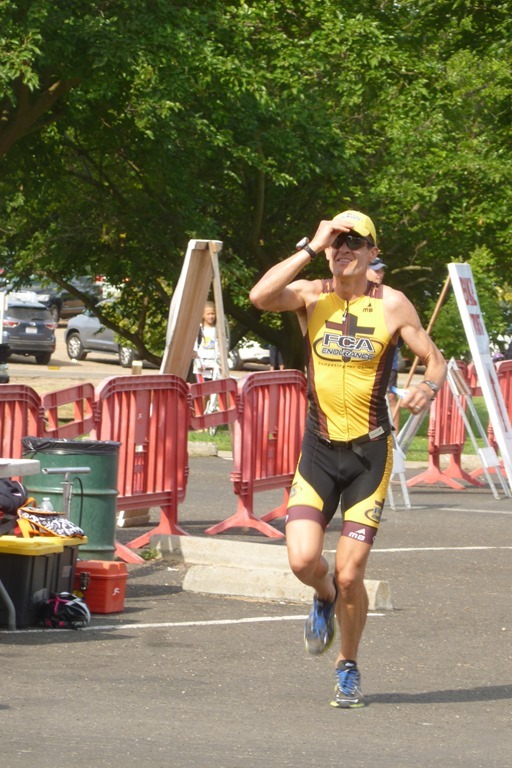 I pass a relay runner and then no one else is in sight. It's just me and the dusty road. But the weather is great, mild temps and slight overcast. I try to keep momentum up each roller. I eat a gel at mile 2 and take a lot of water. Then I start counting runners. I'm #7 at the run turn-around. I'm set on catching one of them. 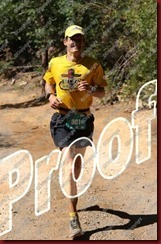 After the turn, however, my hamstrings are really complaining and make me think of my future.. Ironman Tahoe. I see Dave Campbell and others flying behind me. I want to go fast but I shouldn't risk injury. What to do? Pray! There's nothing else I can do, so if anything is going to improve, it's going to be from God. I pray and am content in knowing He's now in control of that. 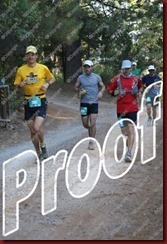 I cheer on Dave going the other way and then head onto the single-track trail along the lake. This is a great course. I know Troy Outman will like it. I usually like the many sharp turns but have to be careful not to pull something. Another Hammer Gel. The hamstrings are doing a little better. Thank you, Lord! At Mile 5, I check my split expecting to see sub-7, but instead see sub-8. Maybe it's a mistake. At 5.2 I check the time left for a 40min 10k and see there's not enough, only 5 more minutes. It just seemed like I was running so fast. I give it all I have the last mile. Coming to the grass I see my girls and everyone cheering. Such a great feeling to have the encouragement and almost be done. I sprint home to the finish. 42:56 (1-1/2 min slower than last year). Total time was 2:12:56, 4 mins slower than last year, but still a good time. My friend, Dave Campbell, 10 years older, beat me! He clocked another sub-40 10k which is amazing. 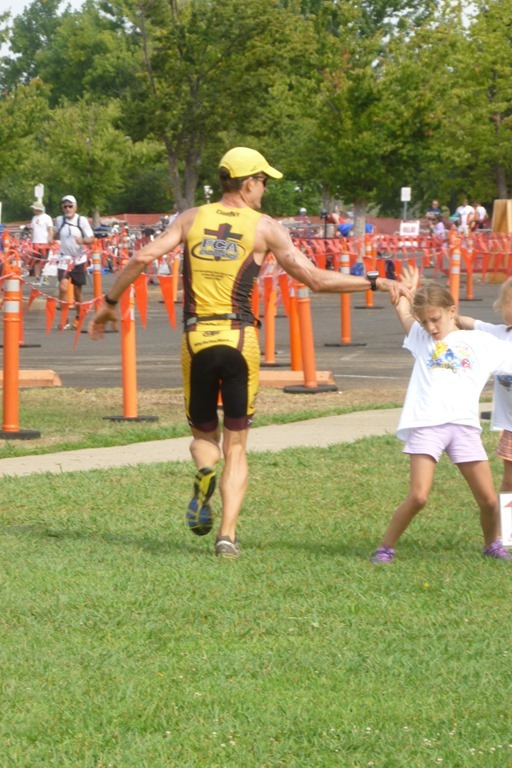 My girls were excited to go on the podium with me for my 2nd place. I'm glad to be racing well, but I know I have more improvement to go. Thanks, Lord, for helping my hamstrings and keeping me from injury. 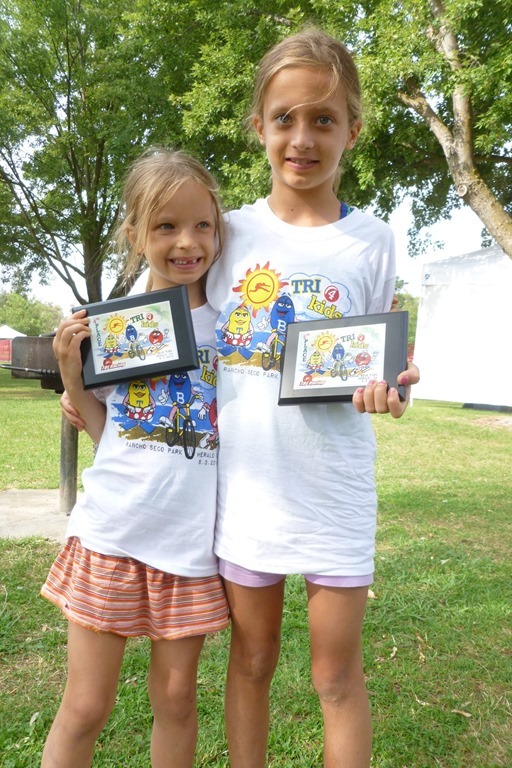 We all had a fun time camping and racing and hanging with family!